You may think Apple Pie for the 4th of July, but in my opinion, nothing kicks off summer like a citrusy, bright and tangy Lemon Bar. 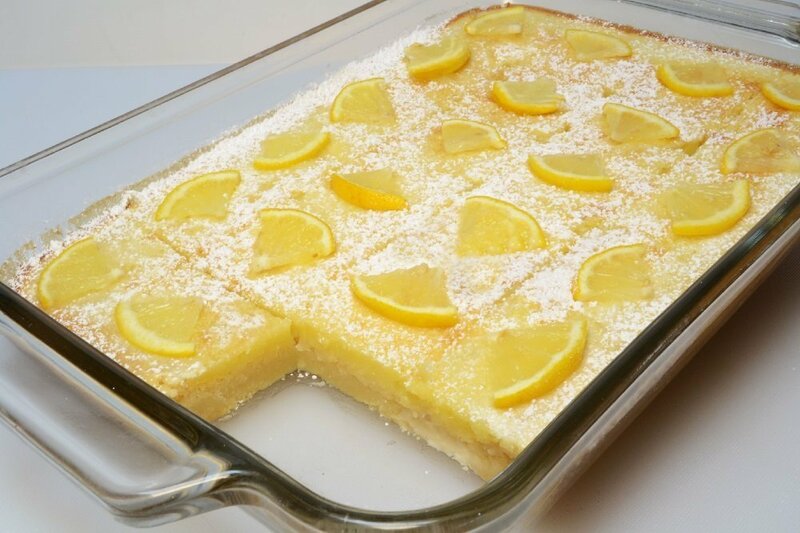 Although lemon loaf, lemon curd, lemon cakes, pies and cookies have been around for centuries, the lemon bar or lemon square is apparently a relatively new creation. In fact, the website joepastry.com, credits the R&D department at Betty Crocker Inc. with dreaming up the very first lemon bar and printing the first known recipe in 1963. In 1993, Betty Crocker added the Lemon Bar to its Supreme Dessert Bar line of baking mixes, but nothing compares to making lemon bars from scratch. A four ingredient crust and a few more ingredients to make a filling and you’ve got a fantastic dessert that is delicious chilled or room temperature and travels well for your 4th of July Picnic. Where did I get the recipe? I adapted it from my 1992 Betty Crocker’s Ultimate Cookie Book, of course! Preheat oven to 350 degrees. Line a 9 x 13 inch baking pan with parchment paper or lightly spray the pan with cooking spray. With an electric mixer (using paddle attachment if available) cream together butter and sugar. Add flour and salt, mixing just until dough comes together. Press into the bottom of pan making sure to pat evenly on the bottom and about 1/2 inch up the sides of the pan. Refrigerate dough for about 15 minutes. Place pan on middle rack in oven and bake for 15 to 20 minutes or until lightly golden brown. Let cool while making the filling. Whisk or blend together eggs, sugar, flour, lemon juice, lemon zest, milk and salt. Pour into baked crust. Reduce oven to 325 and bake for about 25-30 minutes or until filling feels slightly firm to the touch. Cool to room temperature. (Bars will firm as they cool.) Sprinkle with powdered sugar, slice into square and garnish with lemon slices if desired. Serve room temperature or chilled. Makes about 20 small squares.